Thanks GG, that's good to know something is being done. I was last in the square at the beginning of the week, or maybe last weekend, and nothing was happening at that point. Took these towards end of last week, d.c.. The improvement is obvious in those latest pics. I hope that they keep on top of the problem now, at least with the Cenotaph, if not the various other statue plinths too. It does look as if it is now an issue that might need regular attention. George Square was handed over to BBC Radio 1's Big Weekend last night, when top DJs performed to a crowd of 14,000 music fans. (Some might question why the Square had to be used for this event. Glasgow Green is being used for the main event tonight, when a crowd of 50,000 is expected). The City Chambers as you have probably never seen them before and the most amazing part is that Gordon Mathieson's face is nowhere to be seen. (It might be tempting to give up at the start of the video, but I think it is worth persevering). Two light shows will be held in George Square later to mark the experiences of Glaswegians during the First World War. One of the shows will see film, images and audio projected onto Glasgow City Chambers during a 27-minute narrative. Simultaneously, a second show will beam the names of every Glaswegian who fell during the conflict on to the Cenotaph. There will be seven screenings of "Glasgow's War" at 19:00, 19:45, 20:30, 21:15, 22:00, 22:45 and 23:27. I travelled to Glasgow and to George Square the morning after Remembrance Day in order to pay my respects to our fallen heroes and to read the wreaths and messages left the day before. I could not get access because there were huge trucks and construction vehicles parked all around the Cenotaph. I asked one of the many men in yellow jackets what was going on and I was told that it was the start of the Christmas festival preparations. What a thoroughly disgusting way to treat our fallen comrades. Dignity? I most certainly think not. I may think twice about making that long journey again. Sorry to read about your experience and concerns, Guest. 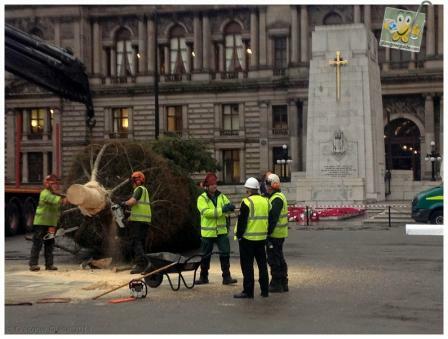 Certainly this has been a problem for the last few years now, where George Square is quickly reduced to a tacky, expensive funfair during the Christmas period, and the process of degrading our most revered civic square starts the day after Armistice Day. 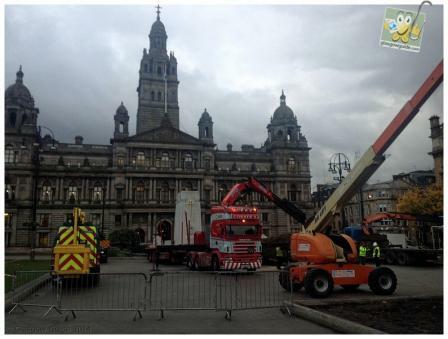 While Glasgow councillors claim to respect our fallen heroes one day, the next they are moving in the heavy equipment and chainsaws that so disrupted your own visit. It has stood on George Square longer than any other building, its Victorian heart unchanged for generations. But now the Millennium Hotel - better known to most Glaswegians as the Copthorne - has announced dramatic plans to expand skyward in to a "futuristic" extension. Owners Millennium & Copthorne Hotels say they have been forced in to the move thanks to two equally dramatic developments now set to go ahead, whether they like it or not. 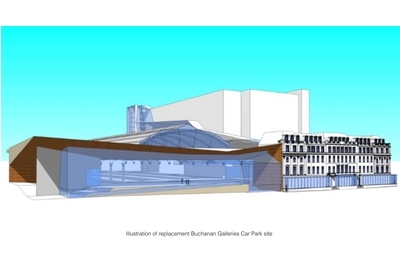 The first is the multi-storey car park directly behind them that has already received outline planning permission as part a council-backed scheme to turn Buchanan Galleries in to a supermall. The second is equally significant revamp to Queen Street station that will see the hotel lose more than 50 rooms as an existing 1970s extension is bulldozed. So the new design - although still to be formally unveiled - will both replace the rooms lost and hide the giant parking lot. In doing so, it will change the skyline of the city's premier civic space forever. Was in the square at the end of January and the benches were nowhere to be seen. Very disappointing as I fancied a wee seat in the square. Does anyone know why they were not there? The stupidity of Glasgow's politicians (most notably the failed and rather silly council leader Gordon Matheson) almost beggars belief. 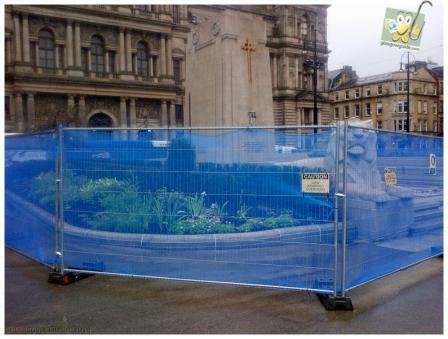 A planned £15million upgrade of George Square has been put on hold indefinitely. In 2012, city council leader Gordon Matheson launched a design competition to give the historic heart of the city a new look. It attracted entries from some of the best architects in the world, a shortlist was drawn up and a winner announced.  But within minutes of the announcement, Mr Matheson said the facelift plan had been scrapped as it did not have the backing of the public. 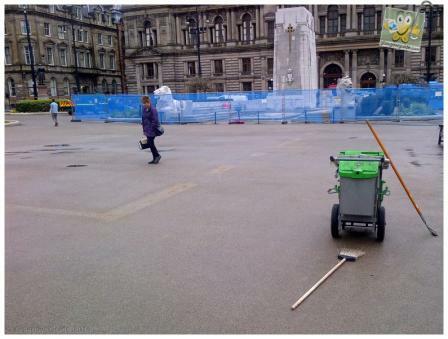 Instead, he said the square would get a makeover in time for the Commonweath Games in 2014 and promised the £15m upgrade would be carried out once the sporting event left town. In July 2013, the Evening Times was told a report would go before councillors within weeks suggesting the permanent improvements which should be made.